There are 1532 posts in this topic. You are on page 22 of 31. I do believe the measurement is from the base of the collar to the bottom of the tumbler without the screw or the latching part, so I think that's why your measurement is bigger. The 1 1/8th doesn't seem to have the bit at the end? But, if it works on classic sterns that would be great! It's pretty much the same as a coindoor lock, expect a bit longer. The latching bar is secured by the screw that's included (square hole). I'm not familiar with classic Sterns and what kind of hardware they use though so YMMV (I would imagine it's the same). You can always email pbresource to confirm. Jimmy is very helpful. 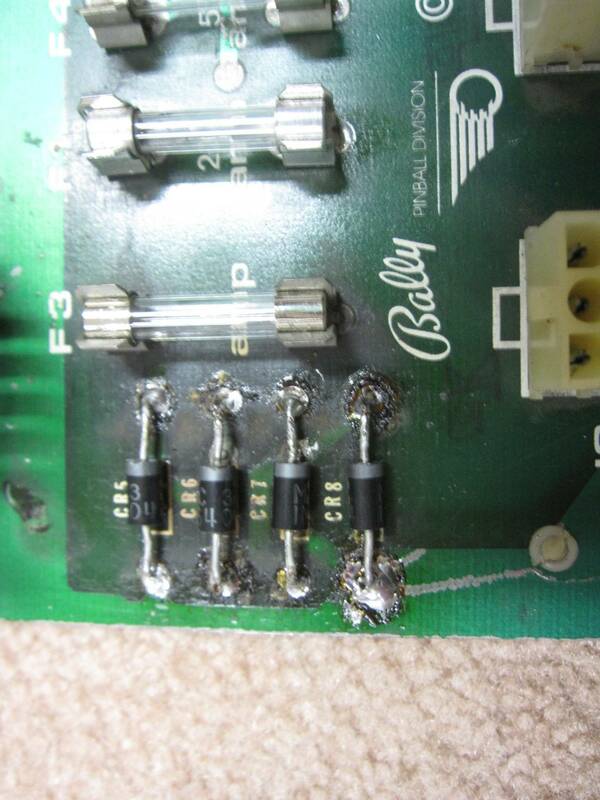 jakers when dealing with displays reflow first, then do connectors (displays and MPU then if you still have missing segments or other issues do your resistors / transistors. The wiggle test can sometimes be telling, as well as swapping display positions ...and seeing if the problem follows. Thanks chalkey I've reflowed the connector pins which didn't fix anything. I've swapped all the displays and the problems do follow with the displays so I'm sure my MPU is working correctly. I've ordered parts based on the pinwiki guide for fixing displays. Now while I wait for those parts, it's time to figure out my phantom pop bumper firing. If I activate the left or right pop bumper, the center fires as well. The center pop bumper works correctly when I activate it. 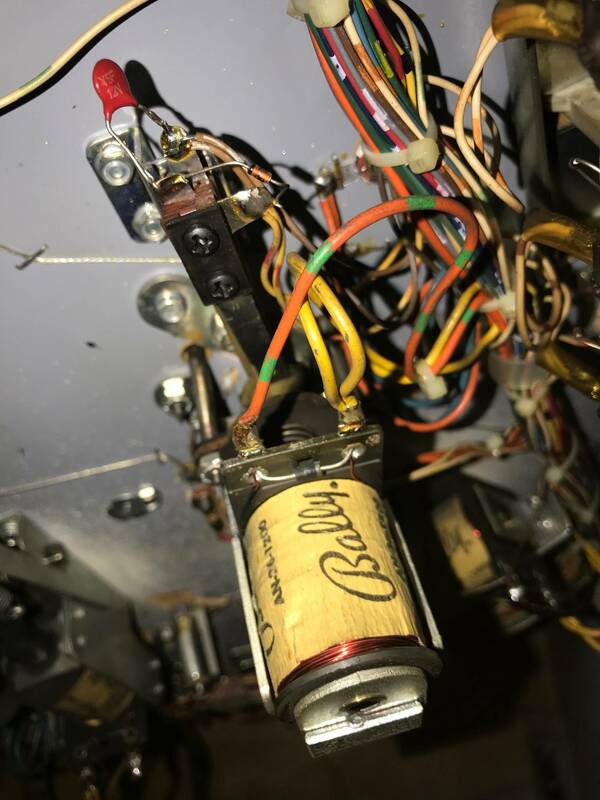 Did I mention this is my first Bally? FUN TIMES! Awesome, sounds like you've got the knack. 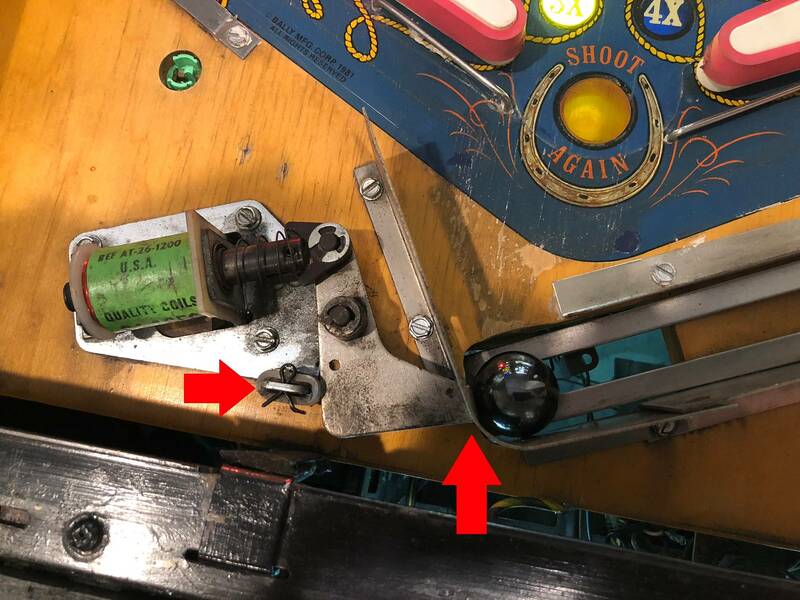 If your pop bumper switches aren't super close (pop bumper causing enough shock to activate the other switches) I'd think it'd be a diode issue. Harlem is awesome. Took me a long time to exorcise the demons from mine. Good luck! I can pound on the play field all day long without the pops firing. When I trigger the left and right by hand, the center fires as well. 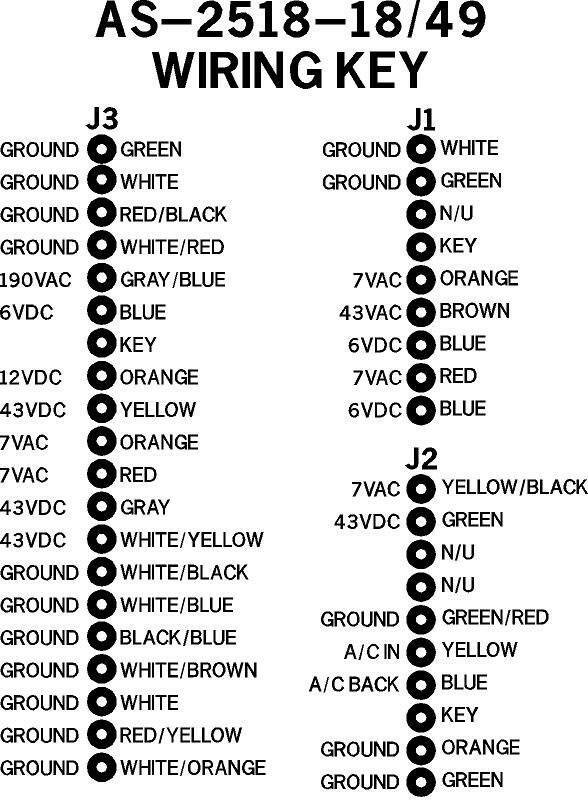 I'm going to separate the J2 wires like others have had success with and see if that helps. 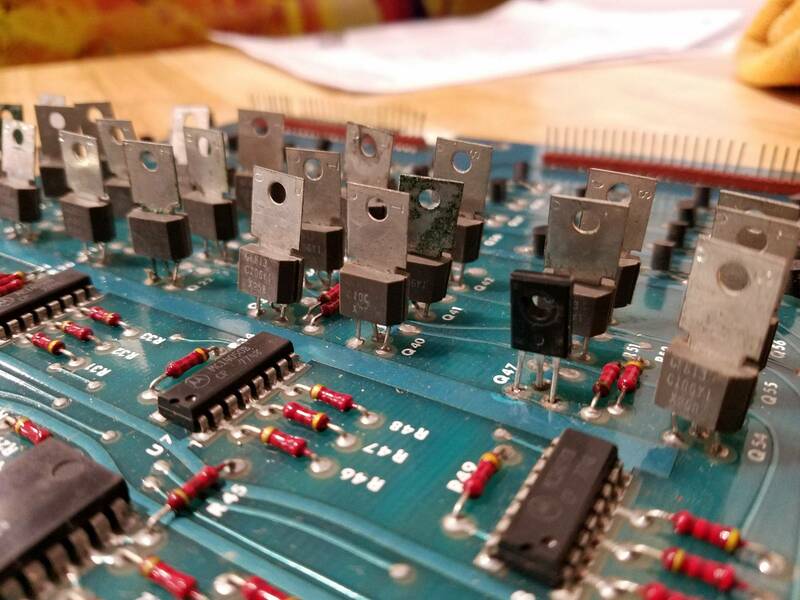 I checked the pop diodes and they seem to be all connected correctly. The lock is a different size to anything I can find on the internet. 40mm or 1.5 inches. And it has a bit sticking out for the bar to attach to. Anyone know where I can buy one?? I replaced mine last year with a lock bought off eBay, cheap. 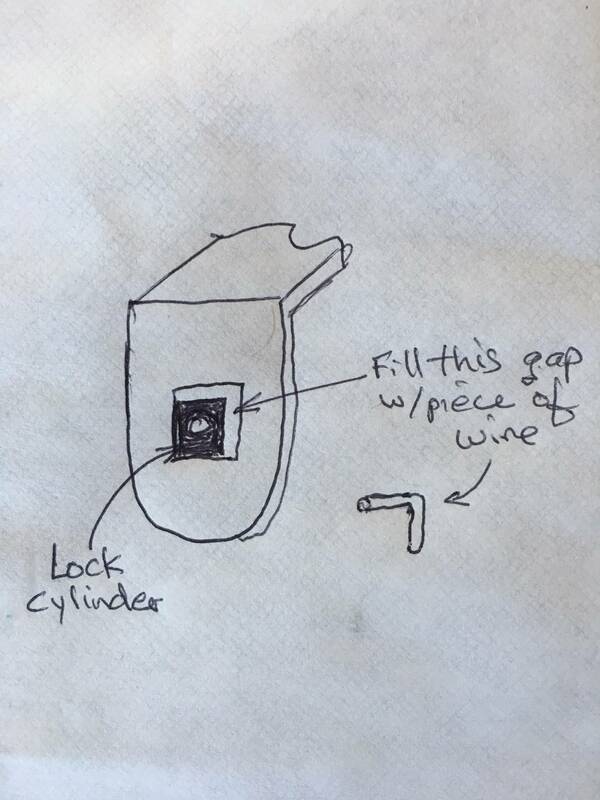 As I recall it was common lock size, but I had to make a little shim (piece of copper wire) to take up the gap at the square where the lock bar attaches to the lock cylinder. See pic. Crazy question -- when does Stern implement the first hurry up in an early SS? when does Stern implement the first hurry up in an early SS? That feature would not come around till John Norris started to work for Premier. A riddle for an answer !!! What -- is -- the -- answer ??? The first classic Stern with a hurry up is: ____________ from 198_. The closest thing I could think of is Iron Maiden. The lower drop targets on the lift, times out and resets. If you want to call that a hurry up. Williams Pharaoh as a "true" hurry up feature. I was thinking of Split Second also, but I think all of the classic Stern "hurry ups" were just timers, not a decreasing point value award. That's very interesting -- so Stern actually had it in 1982. Can you think of any other early Sterns with a hurry up like that? This is a pretty basic question - but Anyone know the screw size to secure boards to the back of offhand? My paragon lost two during my last move and I think the lack of ground is causing a sound buzzing issue. Anyone know the screw size to secure boards to the back of offhand? #8-32 thread, thread length about 3/8"
Hey guys, helping a friend with a Stern Galaxy that is resetting. The game boots normally every time, plays without issue, but after a game or so will reset and reboot without issue. Trying to search around but can't find anything right off the bat on pinside where someone had the same issue. Any pointers on where to look/what to test? I did put a new nvram rectifier board in it, but the issue was there before so must be somewhere else? Thanks! Wiggle connector J4 on MPU. If it resets you need to repin the connector and replace the header. 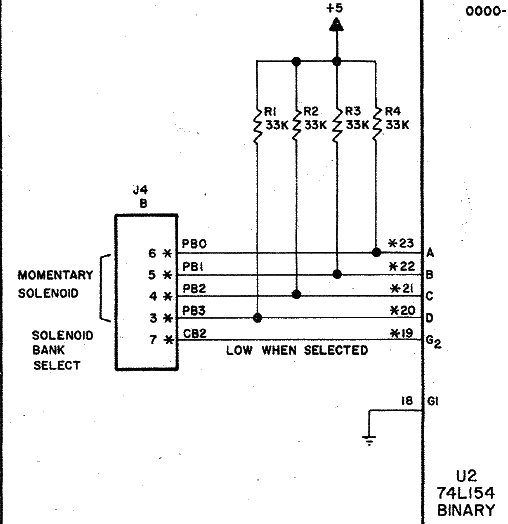 If not that you probably need to recap the solenoid driver board. If a display has a segment out (not all digits, just a single digit with a missing segment) what's the fix? Tried the segment transistor but no joy. Didn't see this symptom addressed in any of the guides. does anyone have a photo of the back of a Skateball Backglass? ok - so the screws didn't help, so maybe you guys can point me in the right direction. When I turn on my paragon, all i get is a loud buzz coming from the speakers... Sound board already has a cap kit. Rebuild connectors on the sound card and work back from there? some of the sound boards like the -32/-50 have isolated ground returns for the digital and analogue sound stuff. When these two grounds are not at equal potential the boards lets off a hum. Sometimes the easy fix is to either pull the board off of the bakcbox ground. But the best fix is fixing up the connectors / ground. It's a Paragon. I had thought it was the ground issue - so I tried to both tighten it down to the backbox, then also float it off the backbox and neither paid any dividends... 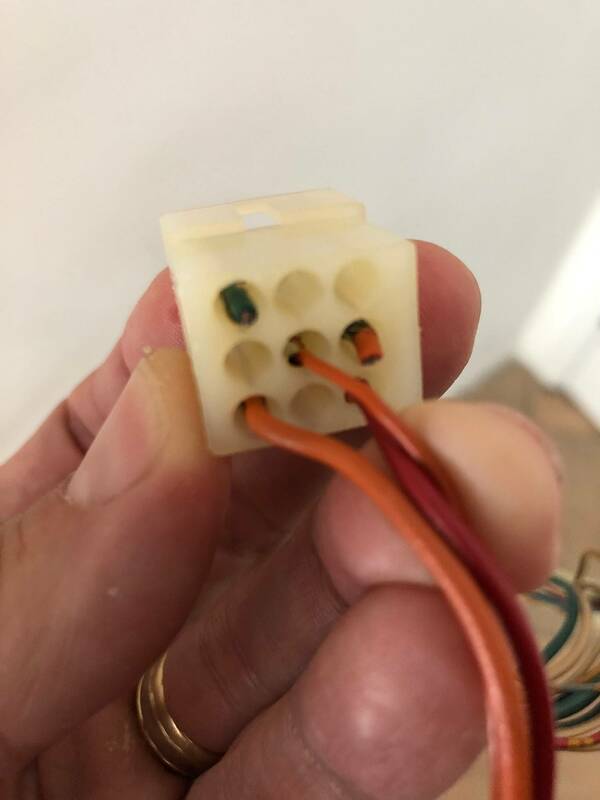 I'm pretty sure it's connectors... I've replaced a few here and there but I really need to buckle down and just replace them all. I have this working machine's sound issue and 3 more AS-2518 generation machines (strikes/spares, flight 2k, big game) in the pipeline, so I'll likely be messaging you with another large-ish order depending on what I find after I get the power boards I got from you last month installed. The first thing I would do is cross-connect the cables (or move the display if the cables are not long enough) - if the problem moves, its the display module (either the connector, display itself or its board.) 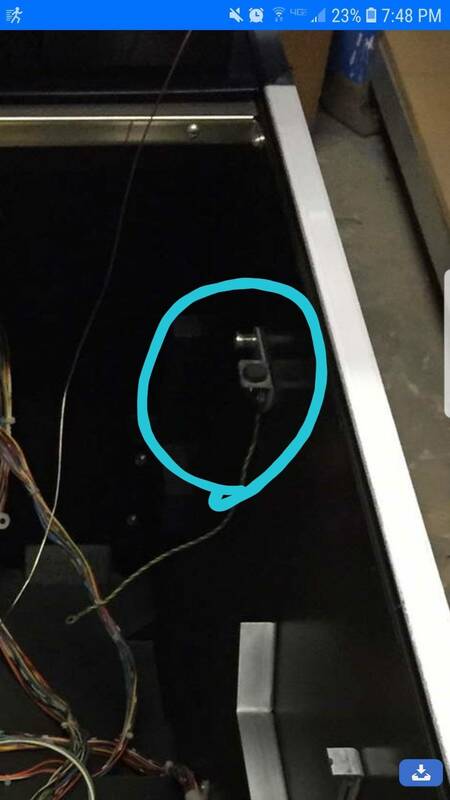 If the problem stays, its either the cable connector or the display board. 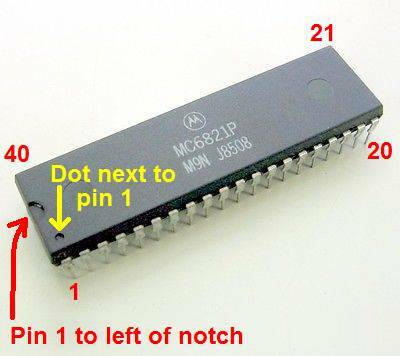 Does anyone have this 24-position connector (male side) that I could get from you…or a P/N so I could buy one? It’s the coin door to harness connector from my Night Rider. I don’t want to cut the one off my existing harness, if I don’t have to. 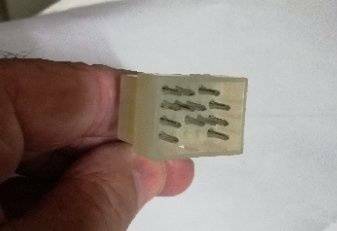 Isn't that a standard 24 pin 0.062 molex connector? You can confirm my looking at the dimensions on the drawing at GPE's site. 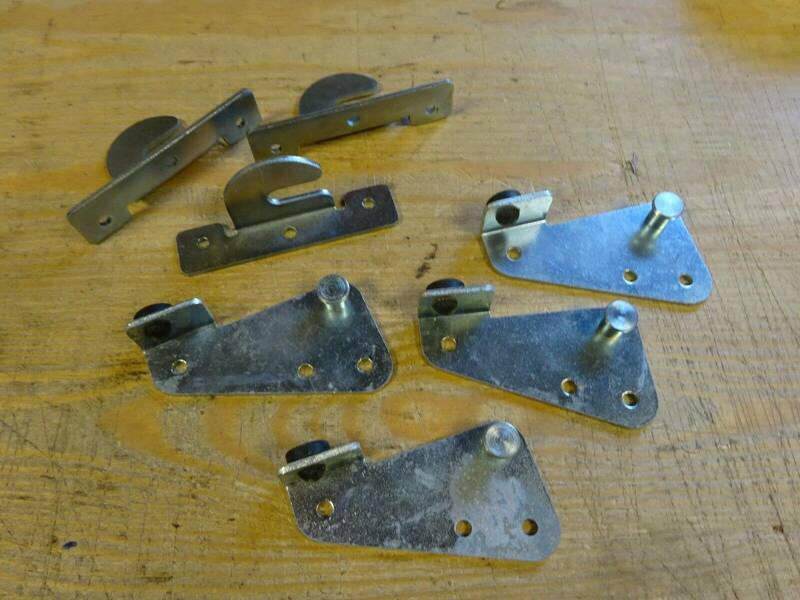 If its the right size, you can order the housings and pins/sockets from GPE. They also sell a tool to make removing pins/sockets from those housings. 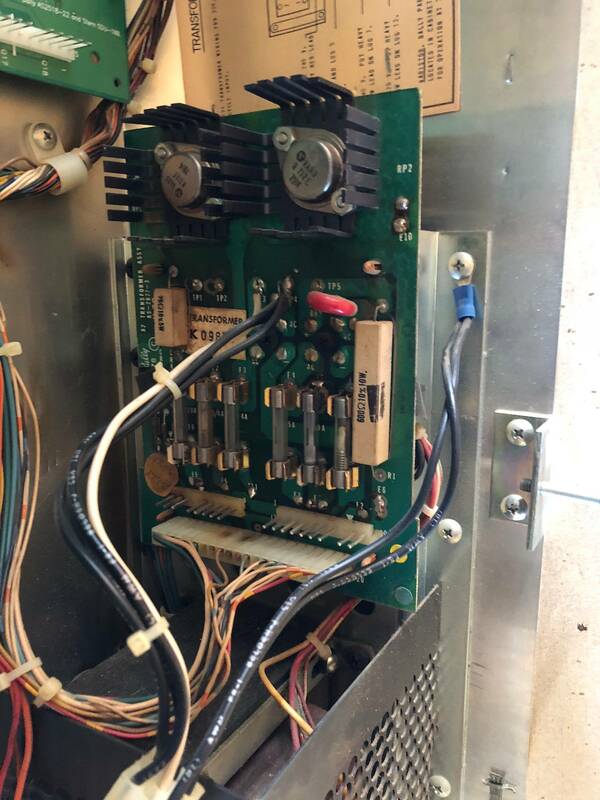 Question - I'm troubleshooting a Solenoid Driver Board (Stern Rev H) and I started going through the rebuild. I found that tying together TP1 and TP3 totally resolved my problem (TP3 was dead) - which is great... but what exactly does that do and should I have any concerns? TP3 is connected to TP1 via an external wire on the solenoid driver board J3 connector. See below schematic. Your fault was probably on the connector and you've essentially bypassed it. 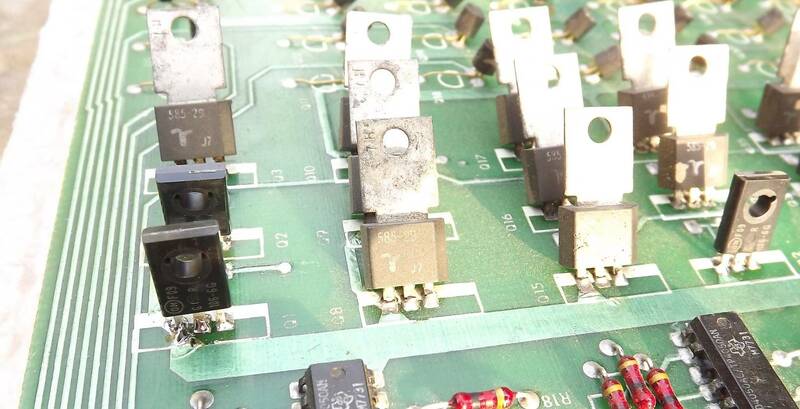 TP3 is the 5V power test point of the solenoid logic driver side. Isn't that a standard 24 pin 0.062 molex connector? Yes it is...I contacted Ed yesterday and was pointed in the right direction by him. For some reason I was unable to find that on his site by searching or flipping thru the connector pages. That's really odd cause I just repinned that connector as well. That got it working for a short while... After I was adjusting finalizing my initial shop out and adjusting contacts, I hit the left sling with the ball and caused it to machine gun a bit. I quickly turned the power off (maybe 5 seconds?) and then was dead in the water again until tying those points together. (actually did it on the front with an alligator clip to test). I tested all fuses, transistors, etc - everything was completely fine save tying that test point together. I need to bulletproof the rest of the board/connectors - but am trying to get it functional and moved downstairs to the arcade as I'm tight on garage space. Strikes n Spares is next unless I move to buzz out continuity and repair rodent chewed wires on Big Game. I'm sure I'll be back with other questions. I hit the left sling with the ball and caused it to machine gun a bit. I quickly turned the power off (maybe 5 seconds?) and then was dead in the water again until tying those points together. You mean the game wouldn't boot? If yes, you've got other problems unrelated to TP3. 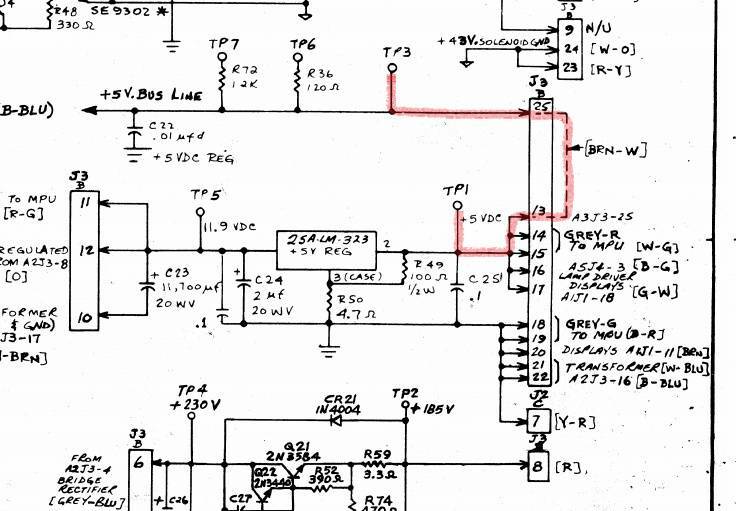 No voltage at TP3 on the SDB will only cause solenoids not to work. You mean the game wouldn't boot? No - everything booted fine MPU wise, just no solenoids. I'm running a new MPU from barkandl until I can find the time to repin the sockets. No acid damage on the original MPU (trust me I was shocked) - but it keeps hanging on the 2nd Flash. I buzzed the socket to the chip and had a few legs fail - so it's time to do some board work. Unfortunately being in the process of settling into a new house; my tools are all over the place and my bench is a total mess. I grabbed a three game deal one week after moving and it's taking up significant space... I'm trying to get as much working (or at least cleaned) and garage space cleared so I can set up the bench/tools - then go from there. Anyway... It was just odd that it kept kicking in and out between power on/off. I'm going to pull the board and do the mod to the back of it correctly - maybe I'll see some damage on that side to explain the issue. On the top side the board looks shockingly pristine for 37-38 years of age. 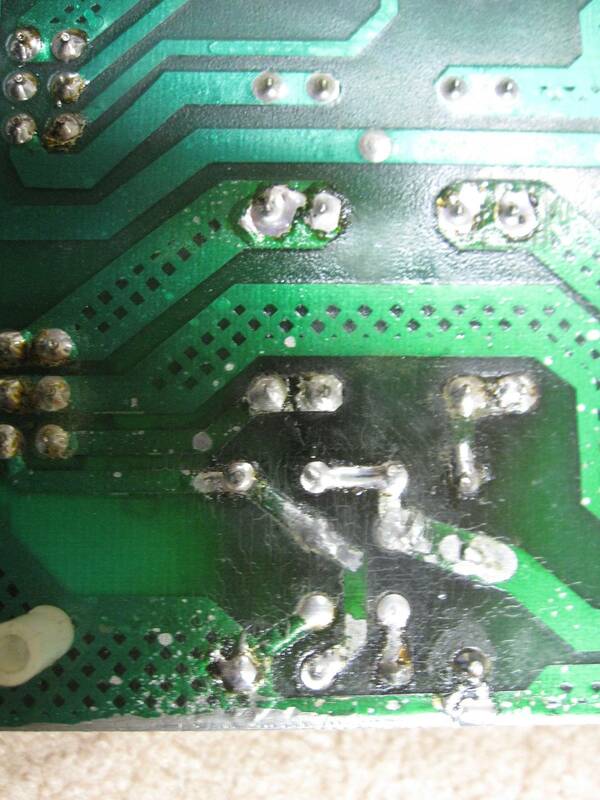 Only two small transistor burn marks that were corrected (and verified by my DMM). Make sure the solenoid fuse on the PF is good. it is usually by the flippers. Check for 43v at coil lugs. 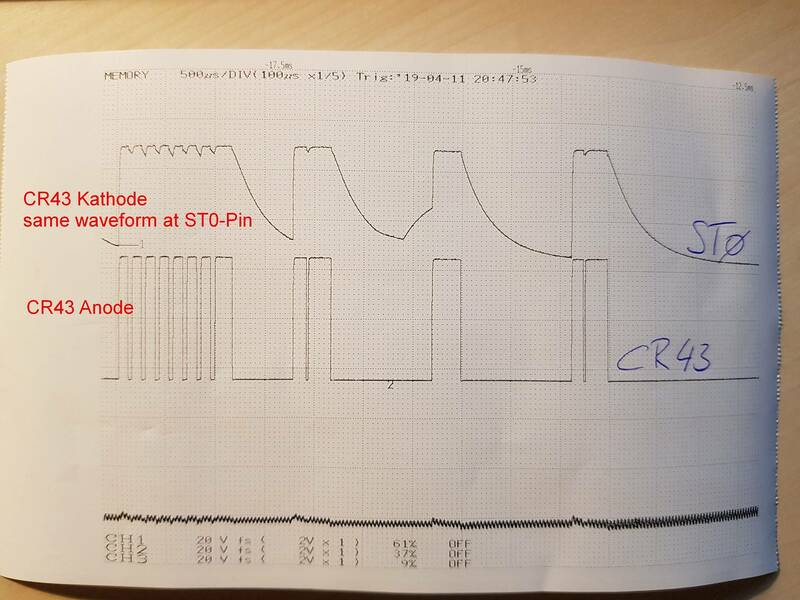 If you see 43v on the pf but no solenoids work check connector MPU j4 tp driver J4. The j4 plug of the replacement MPU will have labeled SOL-A to SOL-B and the SOL/SND. 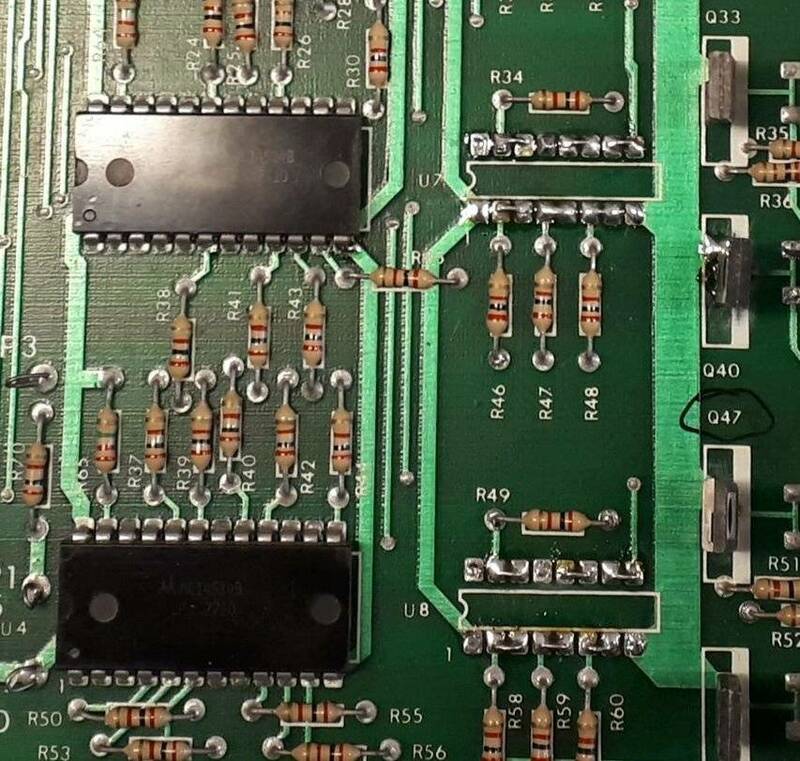 You can find those connections on the driver board and make sure you have continuity from the resistor leg next to the connector, through the connectors, to the SDB U2 pins. If you have a logic probe put the game in solenoid test and check at the driver board. j4 driver board connector and solenoid decoder. What are some ways to troubleshoot a leaf switch not registering? It is a rollover switch on Frontier. Contacts were cleaned and are shiny. The switch gap is adjusted correctly and continuity is confirmed with a DDM. It appears that the disc cap has been cut off, but it should still registering with a manual press during a ball in play. I have not reflowed the solder connecting the wires but that'll be my next step. I have not checked for anything on the MPU or connectors and have not reflowed solder to the header pins yet. 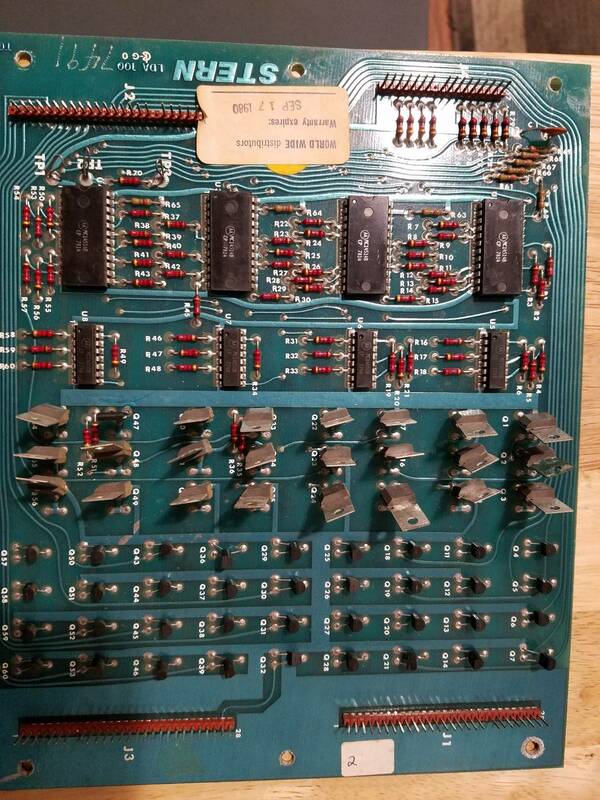 Just got the game a couple days ago so I'm not sure what the solder looks like on the boards. TIA! 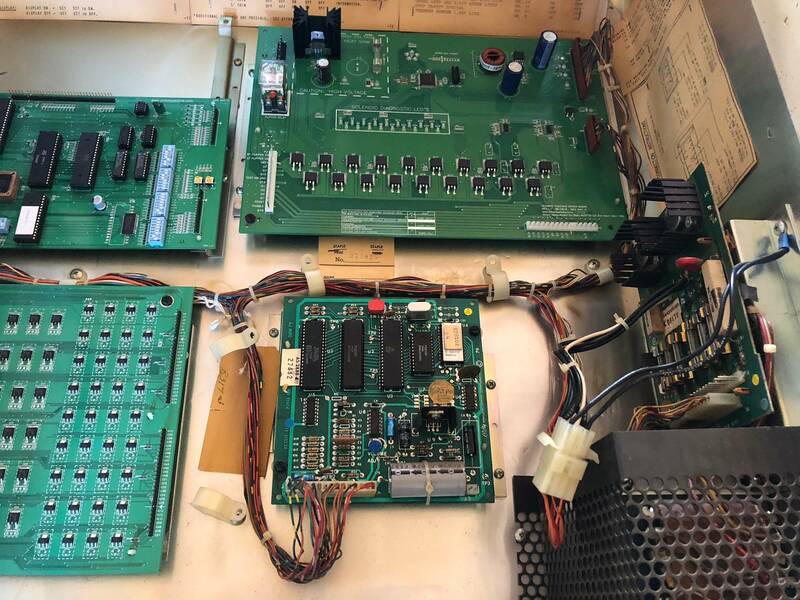 I'd give the connector on the mpu the "wiggle" test and see if the might need to be rebuilt or reflowed. You can also use your dmm to verify continuity all the way from the other side if the switch to the connector, possibly the board if you know where the signal goes. From my understanding the caps prevent missing fast switch hits but one of these smarter guys will have to tell you if that might be the issue. I actually did the TP1 <-> TP3 mod on the original SDB and it's been working 100% without issue since. Now I just need to fix one drop target and resurrect the original MPU-200 so I can use yours in my Big Game that has significant acid damage (The Flight 2k board shockingly had the battery attached and didn't leak!). I buzzed the failing chip (U7) and it looks like the socket has just gone bad over time; Which for a Stern MPU 200 I'd totally expect anyway. But the Big Game has a nest in it - and the wire harness has been chewed a bit. That's going to be a major undertaking to review (buzz wires, review each to replace/repair/etc). So I'm just happy to have F2K working for now while I work on the other. you can close the switch at the MPU connector to rule out a problem there. With the switch matrix chart find the strobe and return number and then use a zero ohm resistor or something to bridge across those two points on the MPU plug. 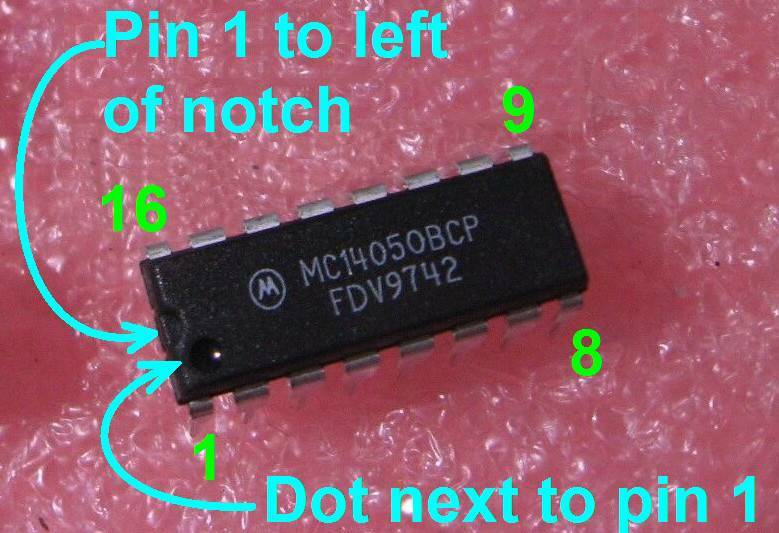 I think the connector pin out is listed on the switch matrix chart, if not go to the mpu schem at find your strobe (ST) and returns (RT) connector pins there. If the switch works on the MPU go to the PF and follow common strobes and returns to see if a daisy chain'd wire broke off. The switches are plated too. If the contact plating got rubbed off it might not work very well. A lot of time you can adjust the switch so it wipes closed in a new, not so worn spot. Hey folks. I'm restoring a Future Spa, and as I'm cleaning up and replacing connectors, I noticed some weirdness I'd love opinions on. Any thoughts as to what's going on here? 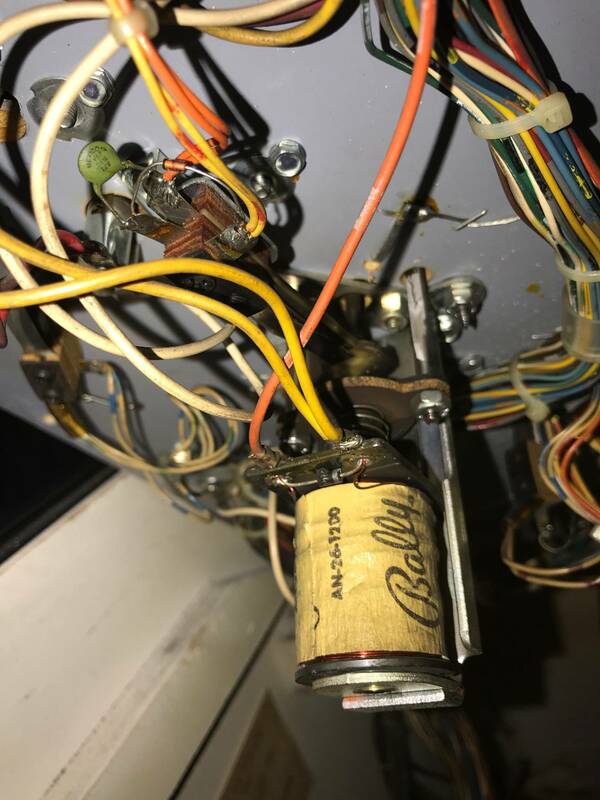 I've got new connectors going in and a new rectifier board from barakandl going in place of the original, I just don't want to blow anything if some previous owner has been moving things around! 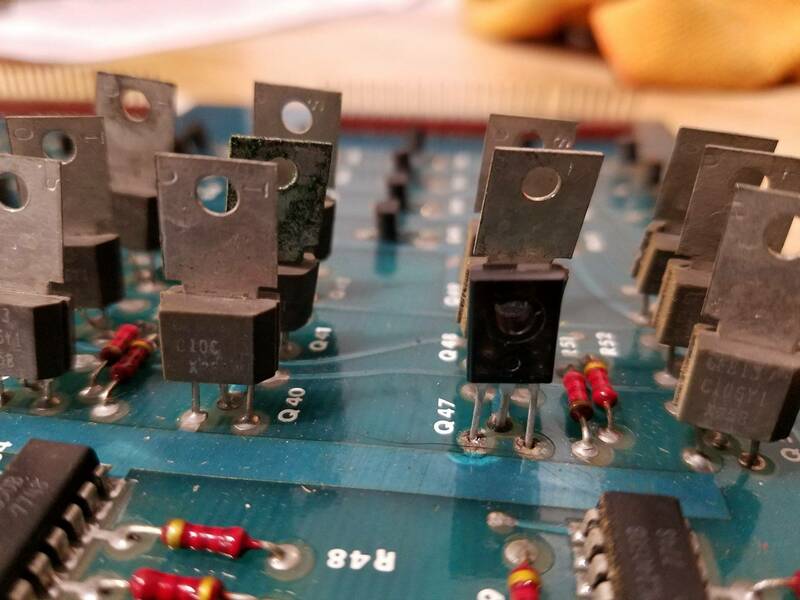 My experience with the 20-pin is that some (lazy) previous owners would cut anything that no longer works on the front side of a rectifier board connection, and just hard-wire it to the backside. 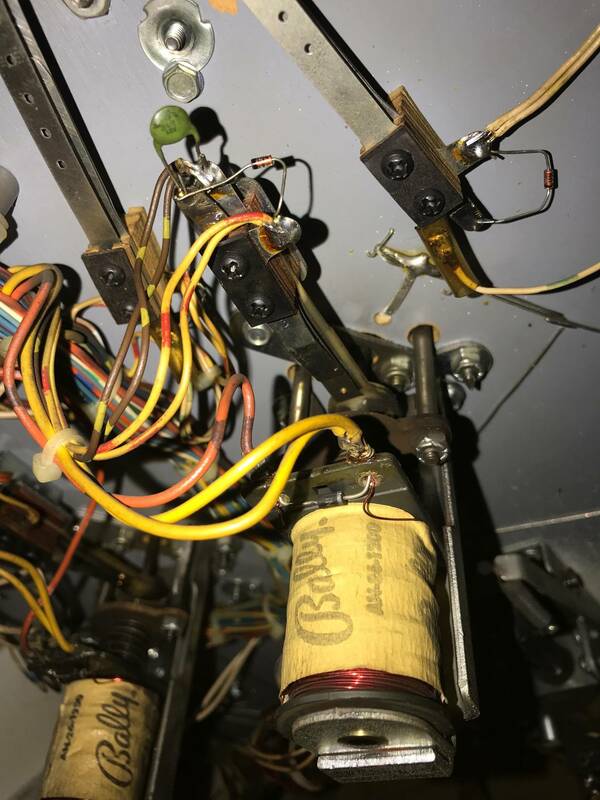 Can you check the schematics to see what color codes those wires are supposed to be, and then see if they weren't hard-wired to the back? On the 20 pin, pin 8, the 12v DC (orange), pin 10, 7v AC (orange), and pin 11, 7v AC (orange). 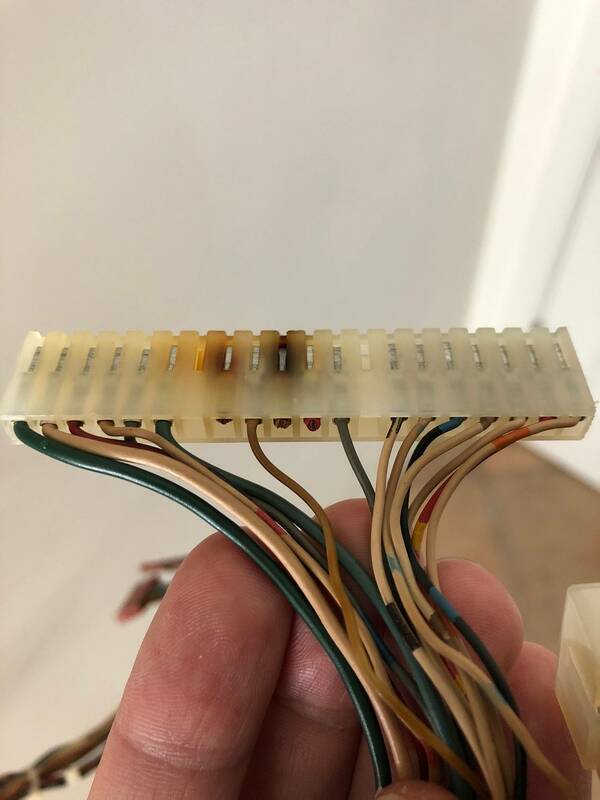 They seem to have been wired permanently into another connector (the 9 pin) and then from there soldered directly to the test pins. Sigh. And now you have the opportunity to clean this house, and make the world right once again. Pretty sweet. Two of the wires involved are orange. One is 12v DC and one is 7v AC. Sorry if this is obvious, but any clue to which one is which? If I had to guess I'd say the thick orange, like the thick red, is AC, but I might as well ask. 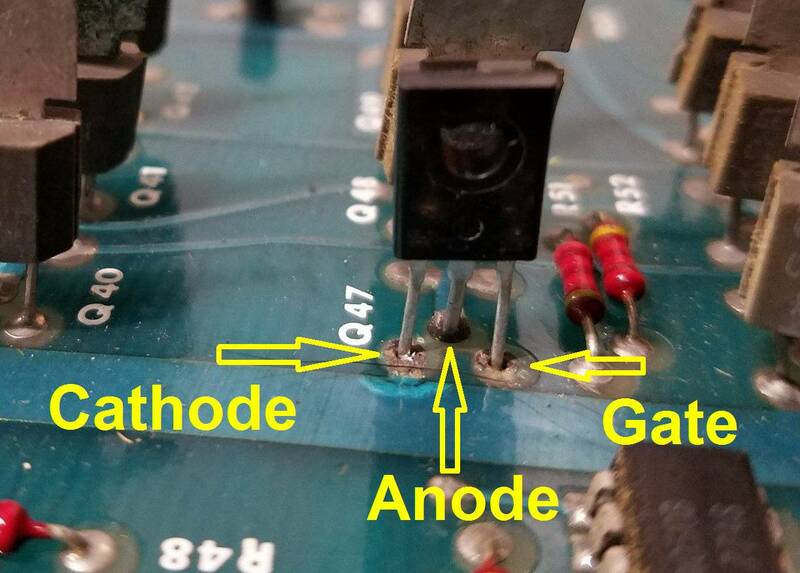 the thinner orange wire on the 20 pin rectifier plug is for 12v ground return (neg lead of big filter cap). You might want to double check to be sure tho. Future spa... display at position "player 4" is out. Displays are all working, changing displays does not change the issue. All test points good (5v, 190v, ground) and the display has the orange glow under the segments when you look down into it. Wiggling connectors on displays, MPU and SDU doesn't cause any change. I re-pressed all the IDC connectors at p4 and the upstream display. Is this potentially a bad U20 IC? What else would cause just the P4 display to be blank? 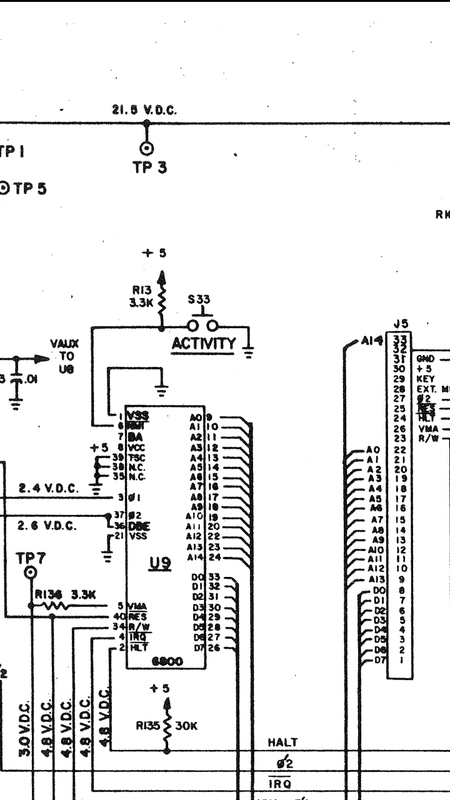 The 4502 at U20 of the MPU can indeed cause a blank display problem. Logic probe compare the latch strobe for the bad display to others. If everything else is working OK, you can asssume the PIA is probably good. Does anyone know what leaf switches I can use to replace the switches for the slingshots? These were the only ones I've used before in a TZ, but not sure if it would work for this era of games. Also haven't had a chance to troubleshoot the non-working rollover switch yet. If I could get it from PBResource, that would be preferred since I have an order ready for them. The score switch you referenced would be fine. You don't need the other switch. You'll need to buy some 1N4148 diodes for them too. Do you know if there is an equivalent from PBR?